The Walking Dead has brought an iconic comic book moment to live action life with Whisperer leader Alpha. Alpha, who first appeared in Robert Kirkman's source material with issue #132, is set to be portrayed by Samantha Morton on AMC's zombie series. With eight episodes remaining in Season Nine, her presence is certainly going to be felt as her debut it set for the Mid-Season Nine premiere. Prior to the first appearance on television, executive producer and director Greg Nicotero shared a photo of Morton as Alpha recreating an iconic moment from her first appearance. Comic fans can probably hear the photo below, as Alpha will likely deliver a "Don't move," line as she did in the comic series for a terrifying debut. The moment is recreated as though it were ripped straight from a page of The Walking Dead comics. By the end of issue #132, Dante found himself in the woods engaged in a fight with walkers. To his surprise, those walkers were actually mixed with living people covered in the skin of the dead. It all concludes with Alpha revealing herself as a human being and taking aim with her shotgun, saying, "Don't move." With the AMC series seemingly giving Dante's story to Alden, it's not unlikely Alpha is pointing her shotgun at the Hilltop survivor. Check out the moment from the comics below. "They're a scary group," The Walking Dead showrunner Angela Kang told ComicBook.com in an interview breaking down the Mid-Season Nine finale. "In [Episode 9x08], we reveal that these are humans. They're not like evolved walkers. 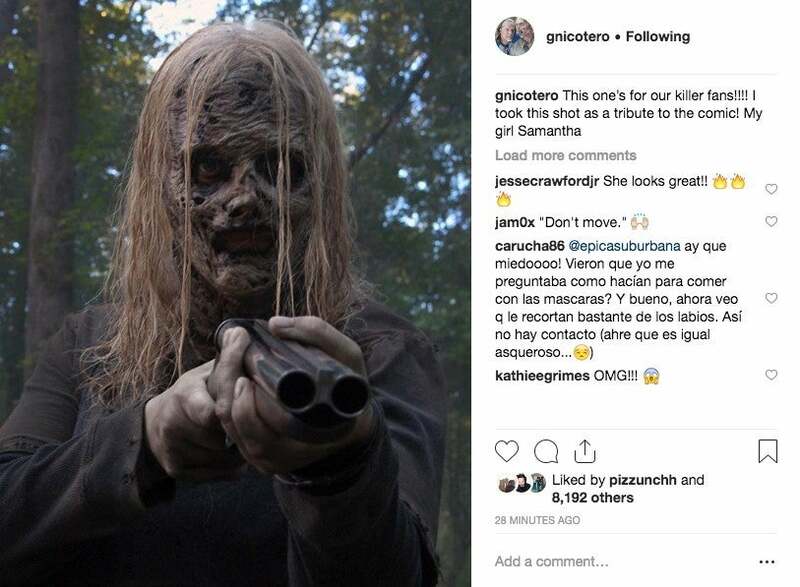 We really start delving into and showing what the Whisperers' philosophy is when we get back into the new season and they are unlike any group that we've encountered before, just their philosophy to survival is very specific." 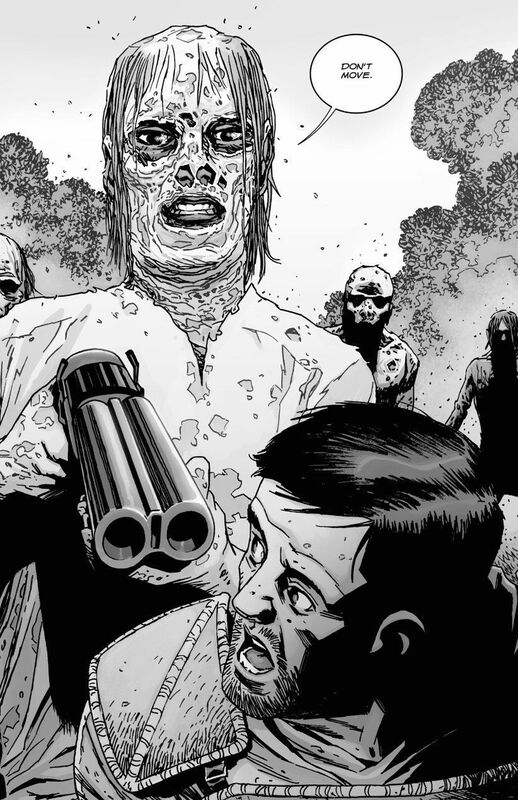 While spending time on the set of The Walking Dead, ComicBook.com witnessed Morton in action as the terrifying villain. One of the most interesting observations was her intense southern accent which brings an unexpected, yet organic feel to the character. "I'm really excited about the cast we have. Samantha Morton and Ryan Hurst as Alpha and Beta," Kang said. "I just think they brought so much energy and intensity already to the process, like in such a great way. And I think we get to tell a bit of a story that is sort of a mystery. I think in many ways they're the most formidable group that we've come across because they have the power of zombies behind them. So that's something that I'm really excited for people to see." The Walking Dead TV series returns for the back half of its ninth season on February 10, 2019 at 9 pm ET. Fear the Walking Dead will return for its fifth season in 2019. For complete coverage and insider info all year long, follow @BrandonDavisBD on Twitter and watch ComicBook.com's After The Dead each Sunday night following new episodes.